Believe it! 2015 Mustang independent suspension makes it's debut. That's only the second time in Ford Mustang history that specifications call for a completely independent rear suspension. The first incarnation could only be found on the 1999 SVO Mustang Cobra, while other models continued to offer the traditional solid rear axle. Some said it would never be done again. And while the previous incarnations of the new Mustang certainly maximized the handling of the conventional solid rear axle suspension, the new 2015 Mustang takes the next generation (sixth generation ) pony car's road manners to world class levels. The sixth generation Mustang is boldly stepping up and taking on the likes of Ferrari, Porsche, BMW, Audi as well as it's usual North American competitors, the Chevy Camaro and Dodge Challenger. 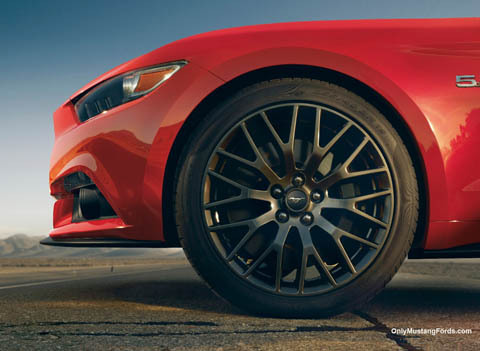 The new 2015 Mustang independent suspension features a completely new integral link independent suspension, including the addition of light weight aluminum rear knuckles, which in addition to changes in the front strut assemblies reduce unsprung weight. And that translates into better responsiveness, handling and ride quality. At ideal levels, your pony car's weight would be perfectly balanced 50/50 over the front and rear wheels. Front engine cars tend to have a greater proportion of their weight over the front wheels, due to the heavy engine, usually sitting close to directly above the front wheels. 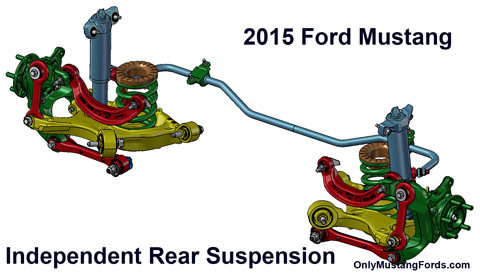 The new 2015 Ford Mustang's suspension and engine have been optimized with this in mind and sit at approximately 52% front / 48% rear, or as close as you could realistically hope to see without the engine placed where the rear seat is located. Motion of your vehicle in situations such as hard acceleration, heavy braking or quick turns can upset this delicate balance. The more refined the suspension, the less effect these issues will have on the car's road manners. And with the new independent front and rear underpinnings in all of the sixth generation Mustangs, these fun maneuvers ( um.. dangerous I mean) are more safely and precisely dealt with. Ford reports that the new 2015 Mustang independent suspension and front double ball-bearing McPherson strut system has allowed them to reduce squat, dive and lift by 200%. Normally, in a high performance car, when you rapidly accelerate, the front end will tend to rise or lift, affecting weight balance and ultimately handling. And if you've ever had to brake hard, you'll remember the way that the nose of your car tries to drive itself down into the pavement, not the best situation for optimal balance and stability. Dive is the result of inertia on your moving vehicle under braking. Most of us have experienced this effect at least once in our years behind the wheel, whether it was someone jamming on the brakes in front of you causing you to brake harder or stop to avoid a hazard. Standing on the gas can also cause the car to squat, or seem to flatten itself down towards the ground at the rear of the vehicle, upsetting handling and stability as well as forcing the suspension to the very bottom of it's travel, making for a harsh ride. Squat is the tendency of the car to transfer weight to the rear of the vehicle under acceleration. Complementing the new rear geometry is the also new for 2015 double ball-joint MacPherson Strut suspension system, not only allowing for more precise and longer lasting components, but provides a platform for larger, more powerful brake components. While Ford has not provided a great amount of detailed information about the 2015 Ford's new hardware, this is not new out-of-the-box technology. In fact, GM came out with a similar looking double ball joint McPHerson suspension appearing on the 2010 Buick LaCrosse, which they coined the "Hiper Strut front suspension". While you might think that having 2 ball joints would be an idea to increase surface area and maybe make for longer wear in the front end, the layout of the system provides a way for the center strut to remain at dead center, with a small casting bracket bolting to both, the top and bottom attachments, to which the upper and lower hub mounting bracket locators are attached. Rather than simply pivoting along that center line, they mount to the castings via an upper and lower ball joint. In this way, a better kingpin axis is created and maintained throughout wheel travel. The strut now only defines the movement of the road surface (up and down) while the new system is independent from the strut and even allows for a simple camber adjustment via an eccentric cam bolt located in the upper area of the casting mount. From my perspective, it seems that there may also be the opportunity for an improvement in the turning car's turning circle. 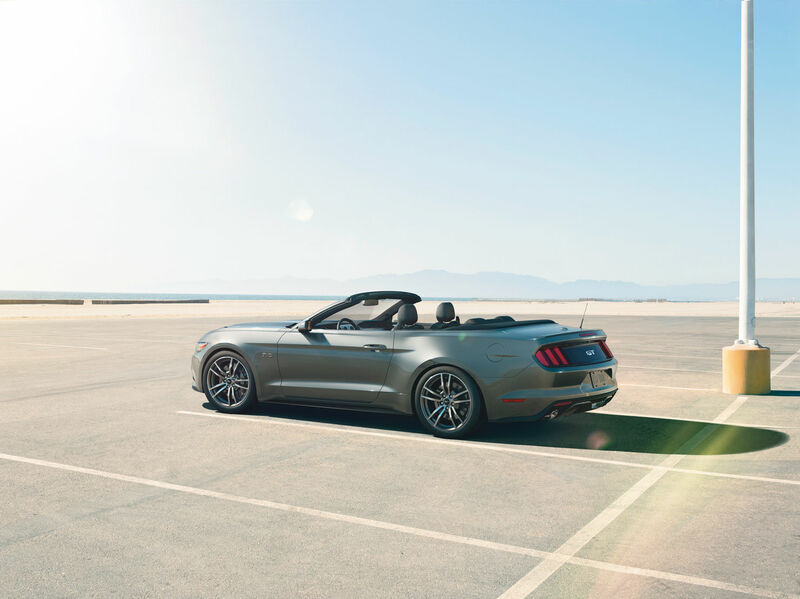 The main benefits seen in the GM system should translate in the 2015 Mustang independent suspension to an improvement in both driver feedback and on center feel. Steering effort should also be improved beyond the benefits to come with the new 2015 Mustang independent suspension. Conventional struts need to pivot the entire unit, since the top strut mount is also the pivot for the top of the hub in a conventional McPherson strut. the new systems now fix the upper strut to the chassis and the new assembly pivots on the much lower/relocated upper ball joint. There's a lot more to the new sixth generation pony car and the 2015 Ford Mustang section is where to find it. 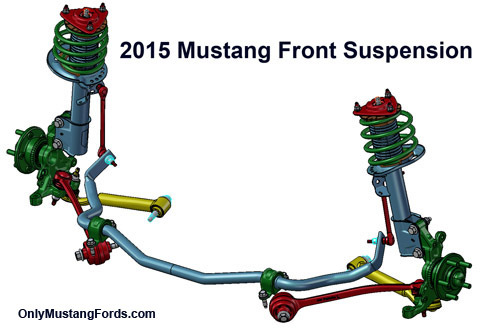 Jump from the new 2015 Mustang independent suspension article to the main 2015 Mustang section . Return to the Ford Mustang home.